The voulge is a polearm related to simple harvesting tools but turned into a weapon of war. Having a large, slightly curved slashing blade on the top, this weapon in the hands of Voulgiers can deliver severe and oft fatal wounds to any unfortunate victims. This weapon is effective against infantry and cavalry. 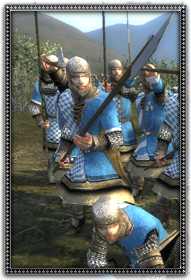 Well equipped, these men make solid infantry, and their polearms make them effective against both foot and mounted foes.